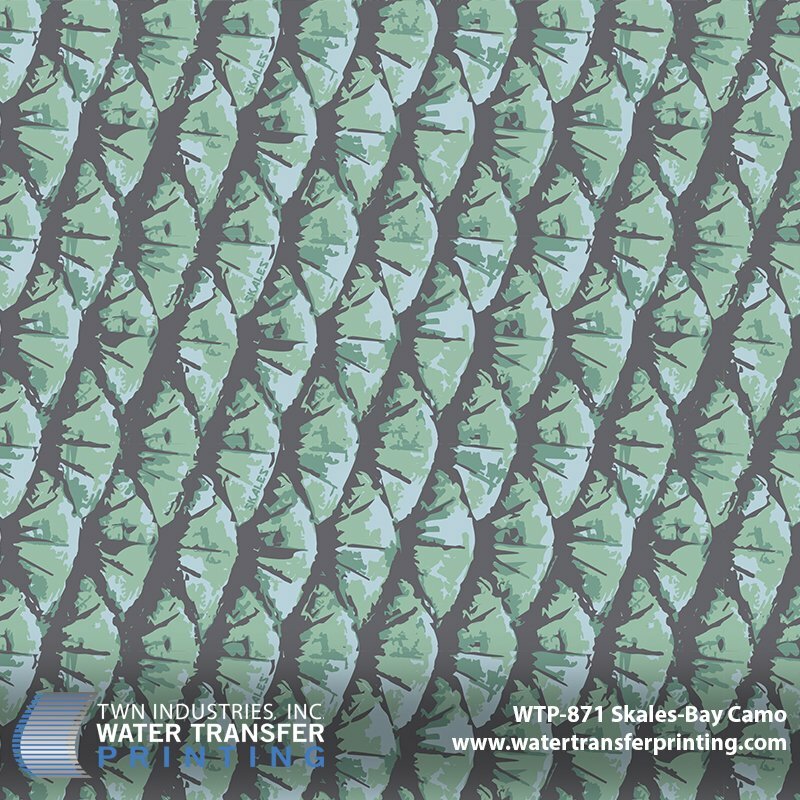 Princeton, FL – October 4, 2016 – TWN Industries Inc., the leading Water Transfer Printing supplier has teamed up with SKALES® for the release of their highly anticipated SKALES BAY® aquatic camouflage water transfer printing pattern. This premier aquatics pattern replicates the ocean’s most effective camouflaging mechanism, fish scales. SKALES® has changed the way outdoor enthusiasts embark on aquatic adventures and revolutionized the camouflage industry as a whole by disrupting the status quo of the traditional ground-based camouflage market. SKALES® was developed by using go-pro vision on the bottom of different parts of the ocean. The deviation in colors you see while glancing up from the bottom of the water is what inspired the creators of SKALES® to develop an aquatic camouflage that is both functional and appealing to the eye. The SKALES® aquatic camo pattern creates a depth and distortion in the water that deceives the eye of humans and marine life alike. This enables you to go incognito on your next diving or snorkeling trip. Instead of having a solid non-transparent object in the water, the SKALES BAY® pattern makes any object semi-transparent and distorted, allowing for a more natural look and feel. SKALES BAY® is a state of the art camouflage that enables the fisherman, outdoorsman, and nature enthusiast to blend in with their surrounding underwater environment and renders them virtually undetectable to aquatic life. If you’re looking to break away from the conventional land-based camouflage pack, look no further than SKALES BAY®. 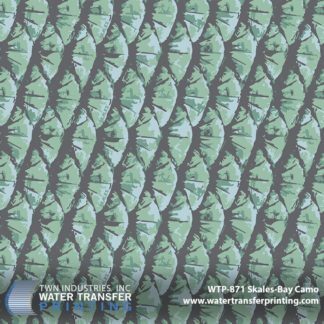 SKALES BAY® aquatic camouflage water transfer printing film is available exclusively through TWN Industries, Inc.
SKALES BAY® is designed specifically for the colors found on shallow, sandy bottoms. However, the pattern is dynamic and performs well in any given marine environment. Spearguns, diving equipment, fishing reels, gaff handles and all other boating or marine accessories. Sunglasses, tumblers, cooler lids, and stand up paddleboard accessories. Boat dashboards, trim panels, and speaker covers. SKALES® camo is a highly anticipated aquatic camouflage pattern brought to you by its parent company Coastal Shallows LLC. Founded in 2015, Matthew Lawson (President/CEO) had a dream to bring the lifestyle that has been developed by “Land Camouflage Companies” to the aquatic and fishing industry. After much research, Lawson decided to create a camouflage that replicates the most prevalent and effective camouflaging mechanism in the ocean…fish scales. With an office headquarters right on the coast in the great city of Corpus Christi, Texas, SKALES® is directly in the middle of the fishing and coastal capital. Today, SKALES® premium line of aquatic camouflage patterns allows people to get closer to aquatic life than ever before. SKALES® camo stands behind our United States soldiers and military personnel and vows to keep all production, development, manufacturing, and design here in the USA.